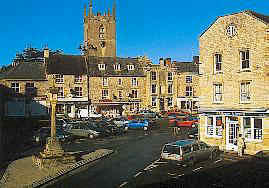 The old market town of Stow-on-the-Wold, once famous for its wool industry and fairs at which as many as 20,000 sheep were sold annually, is one of the Cotswold’s finest places to explore. Little alleyways known as ‘tures’ run between the buildings into the main square, that were once used to herd the sheep, and now home an eclectic array of fine antique shops, art galleries, and independent gift shops. 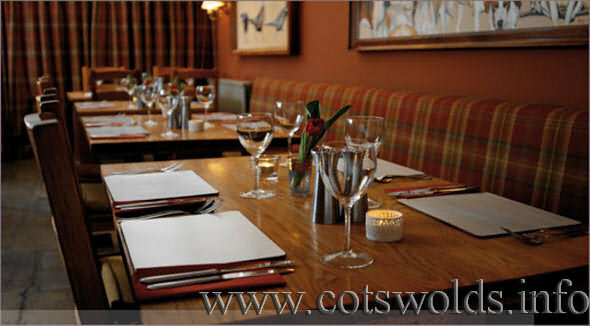 All within a very short walking distance, Stow-on-the-Wold has an eatery for every occasion. The main square alone boasts at least seven different places to pause for a bite to eat. At the head of the square sits The Talbot offering, “light bites, lunches and suppers, fine wines and traditional beers.” With its quirky and colourful interior, this is a spin on a typical English pub. The fundamental large oak fireplace and long bar are still intact, along with the injection of some pop art and mismatched Union Flag furniture. Enjoy a laid-back lunch from 12 noon-2.30pm and dinner from 6.30pm at a very reasonable price with plenty to choose from. 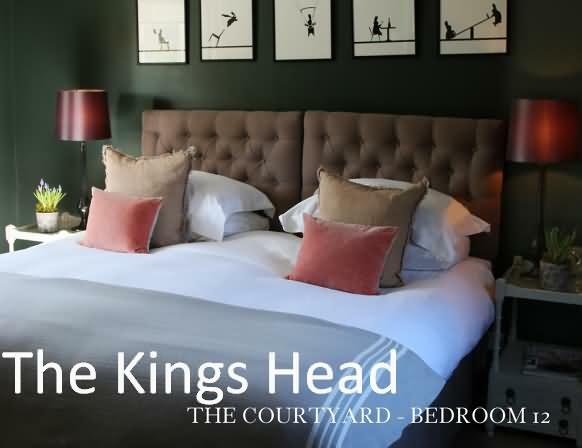 The 500-year-old former coaching inn, The Kings Arms, which sits on the corner of the square, offers a similar experience. Visitors are attracted to the charming historical features of high beams and open fires in a relaxed and informal atmosphere. The full menu of daily specials and sandwiches are available in the bar from 12 noon-6pm. The pub always seems to have a bustling atmosphere, and even offers free WiFi, the admission of dogs and the occasional football game on the big screen! The restaurant upstairs is also a treat with some unusual leopard print decor. A main meal in the evening will set you back around £12.95 with a huge selection of fine wines to enjoy. Don’t forget ‘Pie and Mash Night’ on Wednesdays for a tenner too! Alongside it sits The White Hart, a more modern boutique bar, restaurant and hotel. An extensive, locally sourced menu is available throughout the daytime and evening, offering an alfresco dining area too. Expect to pay around £7.50 for a lunchtime sandwich and £15.95 on average for an evening main course. Their chefs are trained to the highest standard so expect something fantastic! Just a stone’s throw away from the square is Stow Lodge Hotel that stands within a beautiful and expansive garden - an ideal place to relax when the sunshine is out. The very traditional hotel bar is open daily to non-residents for bar snacks from 12 noon-2pm and 7-8.30pm. A varied selection of drinks is also available including Old Hooky Bitter, from an old independent Brewery just 15 miles away. There is also a restaurant with a lunch and dinner menu that changes everyday. Perhaps the most traditional old English pub in the town, The Queens Head Inn, treats guests to proper pub grub with fresh fish on the menu every day. Here locals mix with visitors who are unsurprisingly attracted with the dark wooden and old-fashioned interior. It’s a great place to try some of the local ales and have a natter with the neighbours. If it’s more of a quick coffee and cake you were after, Lucys Tearoom next door is a charming place to stop by in the square. The café prides itself on high quality local produce. From home cooked all day breakfasts, to freshly baked scones and cakes, there is something for every visitor. Sit in the bay window overlooking the square or enjoy all the works of a ‘Stow Special Afternoon Tea’ (£10.90 for one, or £19.90 for two) in the courtyard tea garden. Similarly the renowned Cotswold bakery and tearoom, Huffkins, cannot be missed. With the largest array of delicious cakes and savoury treats, this modern and spacey café is a great comfy stop off to recharge your batteries. The smell just walking past is enough to make your mouth water! Their finest teas are blended with local ingredients including Cotswold fruits and lavender from Snowshill near Broadway. It’s also a great place to buy some delicious packaged gifts. Take a little piece of the Cotswolds home with you in the ‘Huffkins Afternoon Tea Giftbox’ at £29.95 or choose from the selection of locally made jams, honey and shortbread. This charming family-run business has chains in Witney, Burford and Cheltenham too. The family also run a unique luxury B&B at Abbots Grange (built in 1362) in the gorgeous village of Broadway. If you’re after a more traditional English tearoom, Treebus Tearooms sells locally sourced and ethically minded goods and homemade cakes. Sit in the window overlooking Sheep Street and enjoy their quality organic teas from the beautiful mismatched English bone china. Their ‘Cotswold Cream Tea’ will cost you around £5.60. Cotswold Garden Tearooms on Digbeth Street also provides a typical English cream tea experience and hearty English breakfasts, with the choice to take a seat outside in the summer months or beside the large inglenook fireplace in the winter. They also have a B&B if you’re looking for a quaint and inexpensive place to stay. I’d say this place is a must for international visitors to experience - the quirky house even has a world map on the wall where you can add a red sticker to show where you’re from. You can even add your thoughts and comments and a picture onto their big white board on the wall. All in all, a really fun and unique experience! Cotswold Baguettes and The Coffee House on Church Street allow you to order any baguette of your choice to takeaway if you’re on the move. The quick and friendly service makes them both ideal to pop into when you’re short of time. For a more special occasion, whether it be a luncheon or dinner, take a trip to The Porch House, just a five-minute walk from the square at the end of Digbeth Street. Arguably England’s oldest inn and easily the oldest pub in Stow, it reopened its doors last September (2013) after a spectacular five-month refurbishment. Today the building is absolutely stunning, with a beautiful candlelit dining room, low ceilinged bar and cosy lounges and snug. Enjoy a main course from the a la carte restaurant menu from £12.75-£19.95. Bar snacks are also available at around £6.95 for a sandwich and £11.50 for a bigger bite. The Grapevine Hotel on Sheep Street has also recently been refurbished and is now under new management. This restaurant is completely unique in that a real grape vine, over 100 years old, runs from the ground inside and up across the glass ceiling. It’s still growing today and is a sight not to be missed particularly during the summer months. Enjoy a meal in the restaurant alongside the grand piano and murals of the rolling hills of Tuscany. After dinner take to the black glossy bar in front on the huge log fires. A relatively hidden treasure of the town is The Grace Tea & Coffee Lounge & Cotswold Cricket Museum. After the local Tourist Information closed last January, the owners in Brewery Yard decided to take on the responsibility in April and house the TI alongside their café downstairs. It’s a great place to pop by and pick up a few leaflets and have a chat over some homemade cake. But perhaps more exciting, particularly if you’re into your sport is the cricket museum upstairs. The £3.50 entry fee allows to you explore the owners personal and extensive collection, thought to be the only one of its kind in the world. Signed shirts, old jumpers and bats and hundreds of photographs and portraits will keep cricket fans occupied all afternoon. Not to be forgotten is The Bell at Stow, tucked away on the edge of the town. A favourite with locals the charming ivy-clad pub offers everything from a pint to a three-course meal. Don’t miss Champagne Happy Hour at 5pm on Fridays and live acoustic music from local talent on Sunday evenings. Always home to a relaxed and friendly atmosphere, be sure to book ahead as the place fills up quickly particularly over the weekend. Just a mile or two outside of Stow-on-the-Wold don't miss the renowned olde worlde Kings Head Inn at the picturesque village of Bledington and The Fox Inn at the beautiful village of Broadwell.